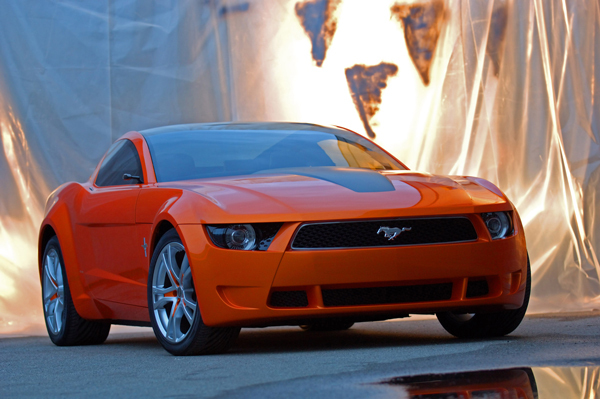 The 2010 Ford Mustang will not be an all new model as was introduced in 2005. However, several sytling changes are forecast as well some upgrades under the hood. On the outside expect to see some of the squarish lines to be altered somewhat to create a more muscular appearance. In particular, a noticeable hip will be added to the body line just rear of the doors. The rear bumper will also receive some sharper lines which should eliminate the 2005-2009 bland bumper cover. The headlamps will receive horizontal bars modelled after the 1970 Ford Mustang and a new grill is expected to be introduced. An optional Giugiaro concept inspired glass panel roof is expected to be offered in this new model. New styled wheels are anticipated. Interior upgrades will include refinements to better position the driver, new colour packages, new vintage styled seats, and an expected navigation screen area. Base motor is expected to the the 2008 Bullitt inspired 315hp V8. However, rumour has a new twin turbo EcoBoost V6 may be considered. Do not assume this is your standard minivan motor - it can generate over 400hp and compete with V8's for torque. But how Ford will make it sound as good as a GT Mustang V8 remains to be seen. Ford has not released any information about special models such as the Shelby GT 500, Bullitt, Mach 1, or Boss models.